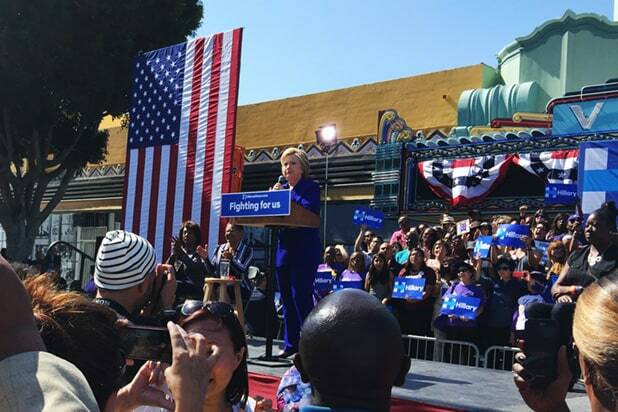 Hillary Clinton made a few stops around Los Angeles on Monday, holding rallies to speak to her Southern California supporters ahead of the state’s primary on Tuesday. 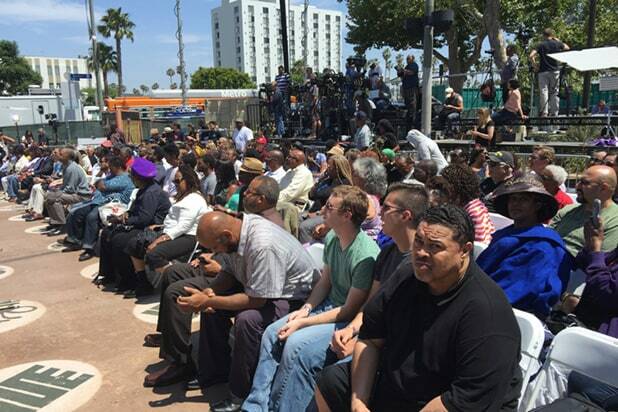 Clinton attracted a crowd of 500-600 people to Leimert Park Village Plaza, the majority of whom were black or Hispanic, a noticeably more diverse crowd than at Bernie Sanders’ rally in Santa Monica two weeks ago. 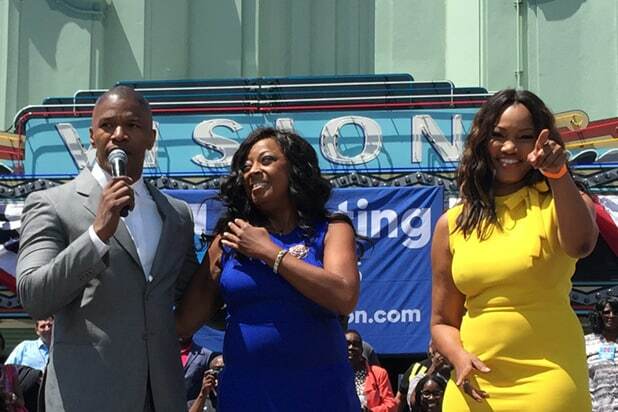 Before Clinton’s own speech, a few of her Hollywood torchbearers took the stage to pump up the crowd, including Jamie Foxx, Star Jones and “Fresh Prince of Bel-Air” star Tatyana Ali. A few hours later, Clinton would head to the Greek Theatre for a concert fundraiser, featuring even more of her famous supporters, including Christina Aguilera, John Legend and Stevie Wonder. 3. Shouldn’t you be in school? Dozens of reporters came out to cover the rally, but one stuck out like a sore thumb: 14-year-old Solal Choffat, reporting for Swiss TV. We asked him what he was doing here. (And where his mom was.) 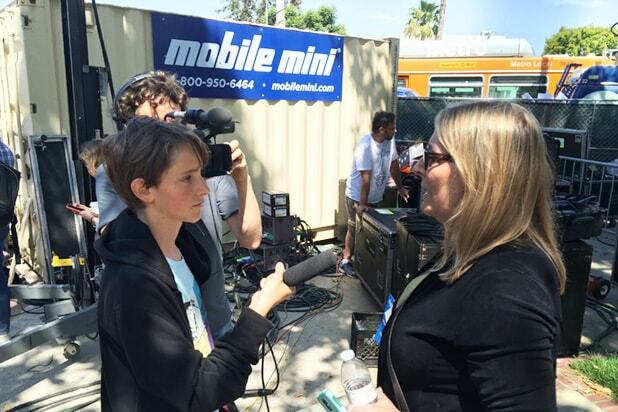 He said he loved politics and came to cover the event. We’re still not sure why Swiss TV would send a kid to this event, but we liked his chutzpah. 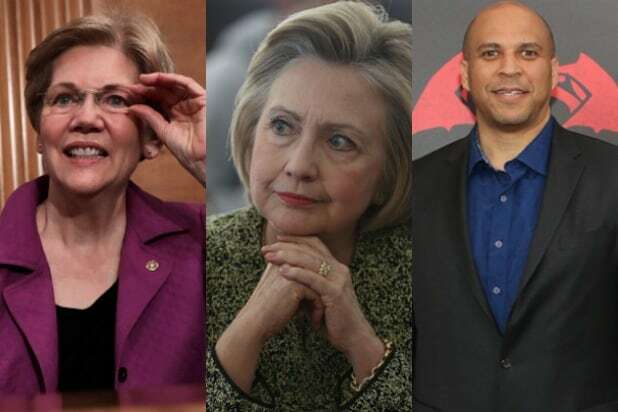 While it seems likely that Clinton will clinch the nomination following the California primary on Tuesday, her supporters bore no malice toward Bernie Sanders and his ongoing campaign. In fact, the Democratic voters at the campaign event said Sanders’ stubborn refusal to withdraw is making Clinton a better candidate. “I don’t think he’s hurting Clinton, I like that he gives her something to compete for.” said Hayley Hutt, a first-time voter and student at Cal State, Monterey Bay. Clinton herself didn’t even mention Sanders in her address, her focus already on the general election in November and Donald Trump. Clinton spent nearly half her speech going after the presumptive Republican nominee.